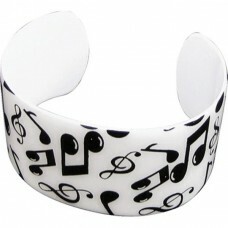 Open band bracelet with notes and musical incidents in black. 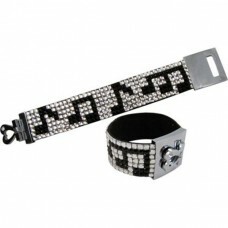 The bracelet is in metal, enamelled an..
Bracelet in steel. 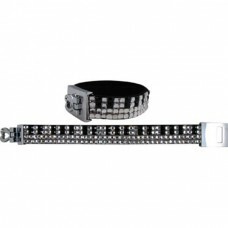 It consists of three thin and luminous chains. One of these has G clefs. Closure ..
Bracelet made of very bright plastic crystals, pyramid-shaped, with a mirror base, representing a ke..
Bracelet made only of very bright plastic crystals, pyramid-shaped, with a mirror base, with musical..
Bracelet with opalescent and black spheres on white frame. It is the technique used by the Native Am..
Elastic bracelet, very pop, with black spheres. Frontally eight cubes with the word CLARINET. For cl..
Small gold-tone steel bracelet with pendants representing 4 G or treble clefs finished in shiny and ..
Gold-colored steel bracelet with a shiny chain. It has as a pendant or charm a large satin G clef w..
Gold-colored steel bracelet with a shiny chain. It has like pendants or charm sixteenths tied. 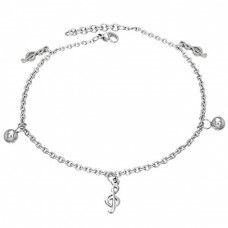 Carab..
Chain bracelet or anklet in steel with very shiny G clefs, interspersed with spheres.DIMENSIONS: Len..
Steel bracelet with pendants representing 5 pairs of tied notes. 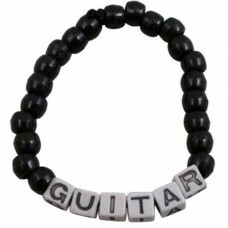 Two are finished in gold, while the..
Steel bracelet with pendants representing 5 electric guitars. Two are finished in gold, while the ot..
Steel bracelet with pendants representing 5 G or treble clefs. Two are finished in gold, while the o..